At some point in the last 20 years, we’ve all dined in a restaurant that was painstakingly designed to astonish its guests, or at least watched a Netflix show about one. Maybe it has a single wall made from 60,000 bottles of Pellegrino or it serves a nest of moss atop a puff of woodsmoke you’re then meant to wash down with an infusion of summer wind. These establishments deserve their ‘oohs’ and ‘aahs’, and it’s all very Instagrammable, until you see that there’s a $1,200 dessert on the menu or get hopelessly lost on your way to the spooky coed bathroom. At which point, all the theatrics and architecture and molecular gastronomy in the world can’t distract you from the single most important question to ask about any restaurant: Is the food good? New Canaan is pleasantly devoid of restaurants where function follows form. Fairfield County rarely gets confused for Las Vegas, for one, but even among our neighbors, we really have the most enjoyable, unpretentious places to eat, all blessedly unburdened by focus-grouped ideologies and avant-garde design. And you’d be hard-pressed to find a more honest and memorable meal than at Farmer’s Table. The notion of “farm-to-table” dining has been adopted beyond reason by the food industry. To wit: once, I was on a flight from JFK to London. The “farm-to-table” menu was presented with great fanfare, and on it, they name-checked the California farm the arugula had come from. As this particular table was hurtling at 500 miles per hour through the sky and nowhere near California, it struck me that the arugula was probably quite tired and homesick by now. I digress. Let’s get back to Forest Street and Farmer’s Table, where farm-to-table dining retains its dignity without having to get all buzzwordy about it. Andrew and I stopped by on a recent, freakishly cold Saturday evening. Entering under an archway of lit branches, the room felt more like a family room than a dining room, with the good cheer of a well-thrown house party. 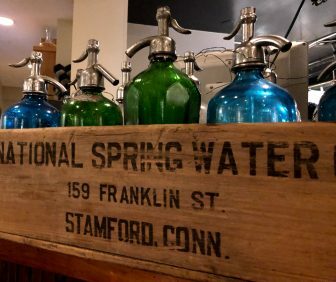 There’s nothing slick or contrived about the décor, with wooden farm antiques, antique soda siphons and nature study photographs hung on the yellow walls. 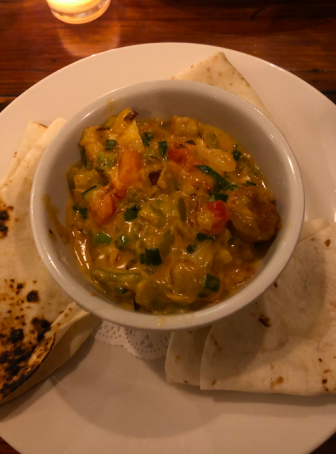 And although it was 7:30 on a Saturday night and the restaurant was packed, they accommodated us without a hitch, seating us at a cozy two-top near the open kitchen. While the restaurant sources only organic, humanely raised, and local produce, meat, dairy and game, it makes a point not to trudge through such distinctions in the menu copy. It’s refreshing. It means you can order anything on the menu with an understanding that comes from the cleanest and most responsible sources available. 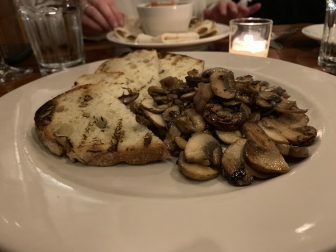 We’ve always been very fond of their Mushrooms and Fog appetizer, a deceptively simple pile of sautéed mushrooms on a piece of Humboldt Fog goat cheese, served for you to pile onto slabs of their grilled, house-made French bread. There was no talking me out of ordering it that night. That said, the special menu at Farmer’s Table is one you don’t ignore, so we doubled down on our appetizers, also trying the Chicken, Chorizo & Cheese. The menu description read “this is something I learned to make when I was in Mexico.” Who wouldn’t want to know more about that? This turned out to be a sort of queso fundido gone bonkers, served with warm griddled flour tortillas. Golden meltiness is pretty near the top of my personal food pyramid, and dipping a corner of warm tortilla into it, I thought about how good it would be to scramble it into a couple of eggs. I made a mental note to host a brunch party sometime for people who aren’t on diets. A glass of Malbec from their super reasonable wine list (mostly New World, no bottle above $95) helped us make our way safely through all that cheese, though if I’m being honest, we were never in any real danger. We checked out the nearby tables, all happy, boisterous conversation from ruddy-cheeked New Canaan folks. Is there anything better on a cold night than being somewhere warm where people are happy? When it comes to entrees at Farmer’s Table, Andrew and I have favorites that we can’t easily be steered away from. 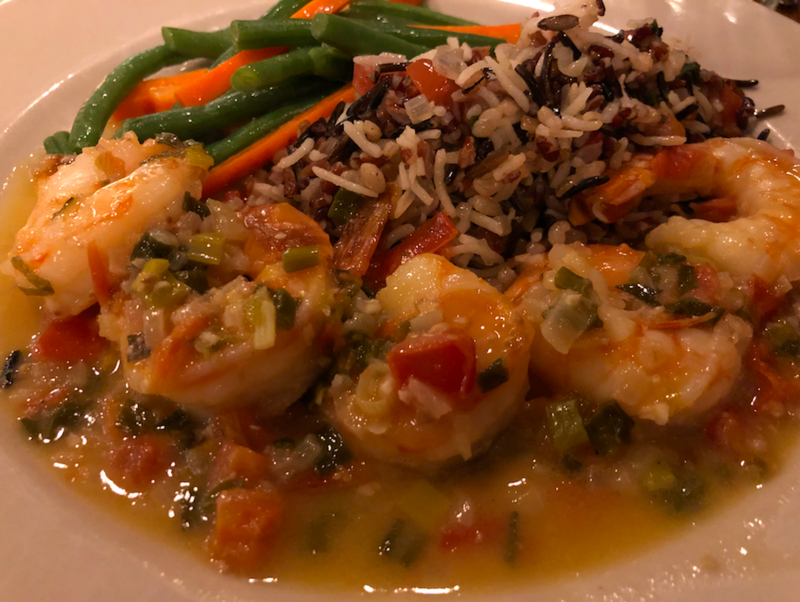 For me, it’s Shrimp Mojo, a dish of five perfect prawns sautéed in a sauce made from, as far as I can tell, garlic, lime, tomatoes, butter and wizardry. 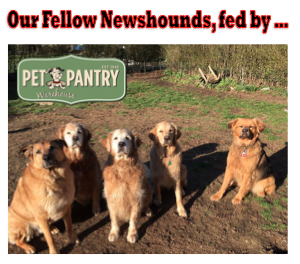 Served with wild rice, green beans and carrots, they’re fantastic, every time. Andrew’s go-to is the stir-fry with lo-mein noodles and duck. It’s a bit lighter than lo mein can be at a Chinese restaurant, but still studded with broccoli, snow peas, julienned carrots and onion. To stray from the Greatest Hits album always feels too risky for us. 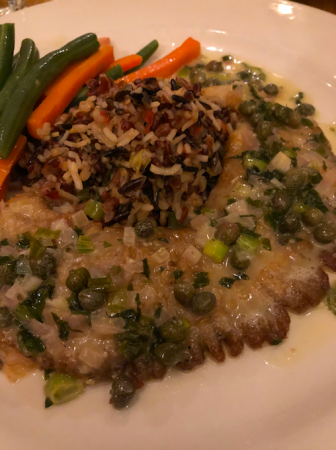 But with great risk comes great reward, and when I chose the skate from the daily specials menu, I found buttery, caper-y Meunière sauce atop crispy-edged, pan-fried fish. There’s something so honest about an open kitchen. You can see that there are no shortcuts being taken, no microwave, and you get to see, smell, and hear your food being prepared. 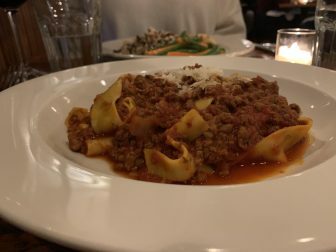 Wisely for a 12-degree night, Andrew chose a bowl of pappardelle Bolognese. The sauce was mellow, almost sweet, and seemed as though someone had taken their time and really paid attention in making it. Most people I know impose some pretty strict austerity measures in the run-up to bikini season, but that night, we decided to be friends with carbs, and I shared Andrew’s pasta while we each had another glass of Malbec. 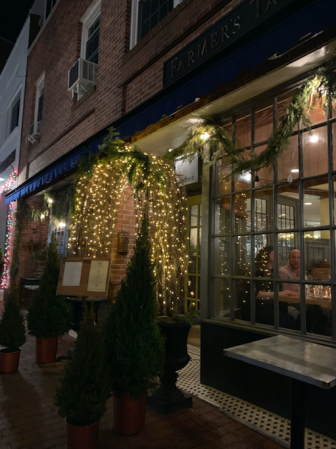 There’s a lot you can expect at Farmer’s Table, like easygoing, efficient service, even on a busy night, and responsibly sourced ingredients. The menu is focused, and not overly long, but even if you’re out with vegans or children, everyone will be able to find something that makes them happy. The sides are consistent and uncomplicated; most everything I’ve ever ordered there came with wild rice pilaf, buttered carrots and snappy green beans, and while that’s nothing to complain about, I do sometimes wonder how great the Mojo shrimp would be over polenta, or puréed cauliflower. The portions are quite generous, so much so that I’m ashamed to say I’ve never been able to remotely entertain the thought of dessert there. We’ve heard that their flourless chocolate cake is pretty special, though, so I guess next time we’ll have to calm down on the cheese so we can try it. For now, though, Farmer’s Table answers the most important question. 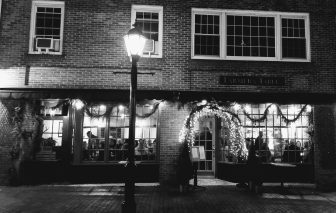 One of my very favorite New Canaan haunts. I’ve been gone for 5 years and still miss that restaurant. I’m glad to read that it’s still just as good! TO THE FARMER’S TABLE –Three cheers to the owners Robert (master chef) and Lucia (who runs the front) for the consistently excellent meals they turn out!! Besides having a great place to eat (you can actually hear other people talk at your table without yelling), their takeout, which changes every day, is full of wonderful surprises also. Try a quart of one of their soups to go like the crab bisque or the seafood chowder! Get on their email list and around 5:30 each night you get the day’s specials to take home.